As a special thank you to her readers, author Laurel O’Donnell is offering her medieval romance novella The Bride and the Brute as a FREE eBook for a limited time! 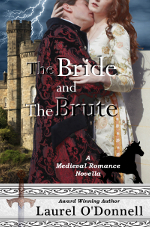 It is not a full-length novel like all of her other medieval romance novels, but it is still a great medieval romance story. And it’s free! Also now free on Amazon for your Kindle!